The impact may have been lessened by last week's leak, but today the company let fly with official info on the Nuvolari-inspired A5 and S5. Maybe today's release was already on the schedule. Nonetheless, we now know the European A5 will get a range of engines from the 1.8-liter TFSI producing 170 hp to the 3.2 FSI producing 265 hp, to a choice of two oil burners (2.7 TDI at 190 hp and 3.0 TDI at 240 hp). As expected, the S5 will get the 4.2 V8 producing 354 hp. Read more from the official launch document below and after the jump. Extra points for reciting it out loud on the Paris metro in a spirited German accent (don't ask). with a high performance potential and a progressive, sophisticated design - a bold step into the future. is a clear and unique statement of sportiness and elegance. At the same time, the A5 offers a driving experience characterized by exhilarating dynamic performance and excellent comfort over long distances.
. Four comfortable seats and a load volume of 455 litres make this car a comfortable long-distance tourer. The dynamic performance is supplied by FSI and TDI engines with rated power ranging from 125 to 195 kW (170 to 265 bhp). All engines share highly eco-friendly and efficient characteristics. The engines' power can be transmitted by either front-wheel drive or quattro four-wheel drive and a six-speed manual or automatic gearbox. The running gear developed for the A5 is entirely new and combines agile handling with the utmost driving safety.
. "The Audi A5 is the most beautiful car I have ever designed", says Walter de'Silva, Head of Volkswagen Group Design, with absolute conviction. 's proportions, for instance, are characterised by a very wide and low stance, a short front overhang and a long, flowing transition from the C pillar to the tail end. An expression of determination characterises the features of the front end: the face bears the hallmark of the new Audi in the form of the single-frame grille, and its right-angled headlights and large air inlets reinforce the architectural impression of breadth in the car's face-on outline. The same holds true for the rear: the distinct horizontal lines and wide, powerfully styled tail lights, which seem to push outwards, underscore the sporting intent of the A5. The side line is dominated by the mighty trapezoidal C pillar. 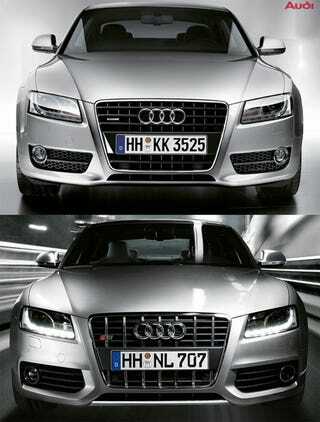 This not only emphasises the car's sporty appeal, but also creates a look reminiscent of the legendary Audi Ur-quattro. A second stylistic tribute to Audi's four-wheel drive pioneer model can be found in the marked outline of the wheel arches, with their curving contours drawn into the wide shoulder line. The lines and surfaces of the Audi A5 play with light and shadows, bringing its shape to life and endowing the body with the sculpted intensity that makes Audi design unique. Audi's customary devotion to detail is particularly evident in the headlights: their elaborate styling perfectly reflects precision and high-tech engineering. The daytime running lights, comprising a strip of eight LEDs on each side, make the A5's xenon plus headlights absolutely unmistakeable. The interior, the interface between person and vehicle, is characterised by ergonomic design and functionality, and equally by the exclusiveness of the materials selected and Audi's typically superb build quality. An atmosphere in which you feel perfectly at ease, even on long journeys - that is the key feature of the A5 interior. The entire cockpit architecture is clearly focused on the driver and brings together the instruments and the centre console to form one unit. The animated shapes, the precision of the workmanship, and the sophisticated design of the controls - these represent a visual delight that is also a joy to touch. The interior design provides a high-quality tactile experience each time you drive the Audi A5. One example of the all-encompassing design approach can be found in the door panel trim, where the controls, inlays, armrest and stowage compartment combine to form one visually harmonious unit. The new key is another design item that also provides sophisticated functionality. With its soft contours and pleasant surfaces it sits beautifully in the hand. But above all, the innovative key dispenses with the conventional key bit. This is possible because it communicates electronically with the vehicle's electrical system as soon as it is inserted into the cockpit. It can also store important information, such as the vehicle's current mileage or warning messages from the Audi A5's driver information system. The data are always up-to-date and available to allow after-sales staff at a dealership to receive the vehicle for servicing quickly and easily. with a distinctly sporty character requires powerful and highly efficient engines. For the Audi A5, power is provided by innovative technologies across the board. All engines supplied for the new model series feature direct fuel injection, for which the petrol engines employ the FSI concept and the diesels are equipped with common rail TDI. This gives all engines a thrilling free-revving character, allowing them to effortlessly unwind their generous torque with optimum energy efficiency. The refined TDI engines with their outstanding sporting talents suit the A5 just as well as the petrol units. Which type to go for is entirely a question of the driver's personal preference. All of the engines impressively demonstrate that efficiency and driving pleasure are by no means mutually exclusive. The top-of-the-range petrol engine in the Audi A5 is a new 3.2-litre FSI with innovative valve gear comprising the Audi valvelift system. This innovation varies the valve lift between two levels. To achieve this, sets of sliding cams are mounted directly on the intake camshafts. These feature two sets of adjacent cam contours for small and large valve lift. Which cam is used to open the intake valves depends on the power demand at any one time. The effect is an appreciable increase in engine efficiency. The driver benefits from greater power and improved driveability, while enjoying a marked reduction in fuel consumption. At the wheel of an Audi A5 3.2 FSI there is a whole 195 kW (265 bhp) of power output available and a superb torque of 330 Nm in a broad rev band of 3,000 to 5,000 rpm, ensuring blistering acceleration at all times. Within 6.1 seconds the 3.2 FSI quattro with manual six-speed gearbox sprints from 0 to 100 km/h. The top speed is limited to 250 km/h. Despite this thrilling performance potential the car's fuel consumption is only 8.7 litres per 100 kilometers (3.2 FSI multitronic). The all-new high-tech four-cylinder unit in the Audi A5 also does full justice to Audi's reputation for leading engine technology. The 1.8 TFSI, delivering 125 kW (170 bhp), will be available from autumn 2007. It combines turbocharger technology with petrol direct injection and provides a burst of acceleration and pulling power unrivalled in its class from virtually every rev band. Just as it did with its TDI engines, Audi has accomplished a pioneering feat of engineering with its turbocharged petrol units, taking spark-ignition engines to a new dimension in fuel consumption and driveability. is the thoroughly revised 3.0-litre engine. It now delivers a power output of 176 kW (240 bhp) and its maximum torque is an immense 500 Nm. But that is not all: with its supreme 0 to 100 km/h acceleration time of 5.9 seconds and a top speed of 250 km/h, the Audi A5 3.0 TDI quattro is one of the sportiest vehicles of its kind. Added to this, it also offers an average fuel consumption of just 7.2 litres per 100 km! driver. Nevertheless, its performance figures are more than impressive: it offers a top speed of 232 km/h with an average fuel economy of 6.7 litres per 100 km. On top of that, its acceleration time of just 7.6 seconds confirms the sporty credentials of this version of the Audi A5. The Audi A5 2.7 TDI multitronic is equipped with front-wheel drive, while the 3-litre TDI with manual gearbox constantly supplies power to all four wheels. As in numerous other Audi models, the quattro permanent four-wheel drive in the Audi A5 enhances driving dynamics by distributing 40 percent of engine power to the front axle and 60 percent to the rear axle at its basic setting. The system adjusts the power distribution depending on the situation and road surface grip. The continuously variable multitronic automatic gearbox, which offers unparalleled power transmission comfort, is available in conjunction with the 3.2 FSI and the 2.7 TDI engines. At the same time its high efficiency and tall maximum transmission ratio make it very economical on fuel, since it operates in the most efficient range at all times. Whenever the driver prefers a more sporty driving style, the gearbox can be switched to a manual mode with eight set speeds. defines the new standard in its class for precise steering response, outstanding directional stability and superb agility, while also offering first-class ride comfort. The Audi engineers have achieved this with a completely new design of running gear: the front wheels are located by a five-link suspension arrangement with upper and lower wishbones. The wishbones are mounted on a subframe, which is firmly bolted to the body for high rigidity. Another completely reengineered component is the rack and pinion steering. It is located in front of the front axle close to the wheel centre line, and enhances the car's very agile handling by its direct transmission of the steering forces. A key element of the rear running gear is its trapezoidal-link rear suspension with completely new kinematics. It provides a high degree of ride comfort combined with excellent directional stability. At both the front and rear, the main components of the suspension are made of aluminium. The generous dimensions of the brakes are designed to match the car's high performance ratings. The braking force can be precisely modulated and the kinematics of the new rear suspension significantly reduce the so-called braking dive effect. The Audi A5 is nothing if not generous to its driver and passengers. Its generosity begins with its luxurious spaciousness - not just for the front row. On the rear seats, too, the A5 is a full-size touring car. Likewise, with a luggage compartment volume of 455 litres, there is always space left over for a bit of extra shopping, even on a long tour. The loading width of one metre allows easy stowage of large items of luggage, and even well-filled golf bags will fit widthways into the Audi A5 boot. The rear seat folds in two separate sections, and can be released conveniently from the boot. The extremely high bodyshell rigidity, typical of an Audi, provides the basis both for the car's crisp handling and its agreeable feeling of solidness and comfort. In the development of the A5 the engineers have successfully combined supreme sporty performance and agility with outstanding vibrational comfort. Its lightweight body construction was achieved using the latest technologies, such as metal plates with varying wall thicknesses (tailored blanks), combined spot welded and bonded joints, and the use of aluminium, for example, in the front wings. The smooth surfaces of the additional underbody panel enhance the Audi A5's inherently good aerodynamics. One small but typical example of the extensive high-precision work carried out in the wind tunnel can be seen in the spoilers moulded into the sides of the tail lights. can fulfil special requests, it is the Audi A5: how about seat side sections in stone blue Valcona leather, accompanied by seat centre sections in star silver leather, with matching interior headlining also in star silver? To go with that, you can add aluminium hologram inlays or maybe rather laurel wood? The customer has the choice: in terms of design variety, the Audi A5 is luxury class in the full sense of the word, with two types of cloth, two leather varieties, the combination of leather and Alcantara, five different inlays and a wide range of interior colour schemes. Above and beyond that, the Audi exclusive programme from quattro GmbH can fulfil virtually every individual wish. For those looking for an even stronger sporting intent in the A5, the Audi S line offers an extra-dynamic look. The S line exterior package comprises, for example, more distinctive bumpers at the front and rear. The S line sports package includes items such as sports seats, steering wheel and gear lever in perforated leather, black headlining, and special inlays. Even here, there is scope for individual choice between matt aluminium, piano finish black or Vavona wood assam grey. The 18-inch alloy wheels and exclusive paint finishes underscore the look of the S line sports package, while the sports suspension provides a distinct driving feel. as a high performance athlete in a league of its own. The Audi S5 goes on sale with the launch of the Audi A5 series. 's performance with particularly dynamic handling. The special high-performance brakes, recognisable by their black painted brake calipers, always ensure precise deceleration. And finally, the ESP electronic stabilisation programme can be deactivated in two stages whenever the driver wishes to exploit the potential of the Audi S5 to the full on a suitable stretch of road. While the design of the Audi A5 forms a balanced synthesis of sportiness and elegance, the Audi S5 displays the more vigorous features of a powerfully built athlete: the radiator grille possesses the specific look of an Audi S model - painted in platinum grey and fitted with vertical chrome inlays. The front and rear bumpers have a more pronounced outline and the air inlet grilles are more striking. The aluminium-look exterior mirror housings make an overtly sporty impression, as do the colour-keyed door sill trim and the dual-branch exhaust system with four oval tailpipes. Nevertheless, the model's sporty attributes always have a functional aspect: for instance, the more pronounced spoiler in the boot lid yields additional aerodynamic downforce. However, true strength comes from within and the interior design of the Audi A5 thoroughly underscores its athletic character. The sports seats, sports steering wheel, instruments with grey dials and aluminium door sill plates provide a dynamic and refined atmosphere. The programme does, of course, provide ample scope to fulfill individual interior design wishes: the inlays are one example - here the choice is between carbon, aluminum, stainless steel or wood. After all, the Audi S5 should perfectly match its owner's individual ideas and expectations. 's 18-inch wheels with the new S design and 245/40 R 18 tyres, the standard equipment specification for the S5 features items such as xenon plus headlights with impressive daytime running lights in the form of an LED light strip, or sports seats with electronic adjustment.